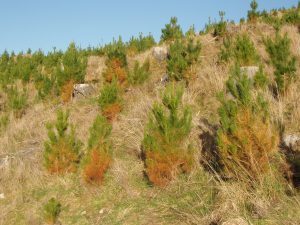 Red needle cast (RNC), a foliar disease of radiata pine, is the primary focus of the Needle Disease Strategy programme. Red needle cast is caused by a Phytophthora pathogen, Phytophthora pluvialis. It results in defoliation, slowing tree growth rates and affecting forest productivity. It is a relatively recent arrival in New Zealand so new research is needed. The vision: to produce faster growing trees that are more resilient to needle diseases. This is a six-year $800,000 per annum programme which began in 2014. 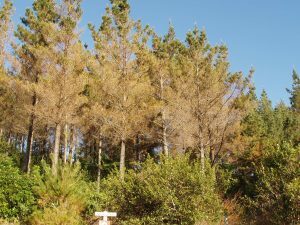 It is closely linked to the ‘Healthy Trees, Healthy Future’ programme, a larger project that includes Phytophthora diseases affecting other species and industries. monitoring the disease and gaining a better understanding of the disease cycle. We can then better predict disease outbreaks, and ensure better timing of control measures. We are using remote sensing technologies as part of our monitoring research. identifying host trees that show natural resistance to needle diseases. By understanding host resistance, identifying resistant genetic strains, and then using advanced breeding technologies, we aim to future-proof forests from known and as yet unknown pathogens. researching chemical and biological control strategies to combat the disease. Also researching ways of manipulating forest management to reduce trees’ susceptibility to needle diseases. 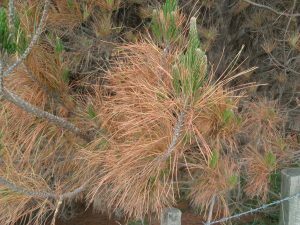 Copper has the potential to control red needle cast – significant because copper is already used to control dothistroma needle blight in pine plantations. Research will now focus on designing optimal application regimes to combat one or both of these diseases. Radiata pine trees showing resistance to RNC have been found, giving a good foundation for research into host resistance. Lindsay Bulman of Scion leads the Needle Diseases programme. Typical red needle cast symptoms. A young plantation affected by RNC.